equinoxx.info: Have You Seen This Man? His name is Richard Morgan Fliehr but is best known under the names: Ric Flair, 'Nature Boy', 'Sixty Minute Man'. He was last seen at a Total Nonstop Action house show in Dublin, Ireland on Monday night. After this appearance, the wrestler held up his promoters for more money for the tour he was on. 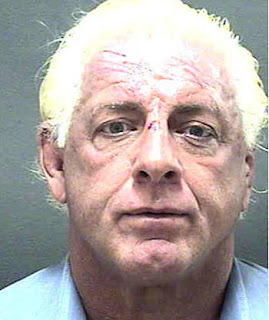 His employers didn't comply so Mr Flair refused to travel with his colleagues to Germany. He was due to appear at other venues across Europe most notably in the United Kingdom in events where he was the focal point of advertising. TNA promoted the entire series of shows after this man. They named it the Wooooo Tour. The card always 'subject to change'. -I don't know which side is right in this. I would hazard a guess that TNA are and if so, shame on Flair for doing this to a base of fans that were willing to give TNA a chance because one of the greats is on board. With that said, shame should also go to TNA for promoting these events with Flair as the marquee name. It's going to be a tough few days for them if he isn't at the remaining shows on this tour schedule. It could cause a lot of damage for the company having advertised two main event names that didn't appear although, in Kurt Angle's case (girlfriend collapsing and having to have an induced labour), it's very much understandable. With Flair, not so.